Tearing your ACL is one of the most serious injuries an athlete can experience. This can sideline you for a long time, usually from half a year to an entire year. Basically when you experience this, your entire season is over. This is something that happened to me this year and unfortunately brought me back to square one. Before the injury I was finally getting into a good lifting and sports routine, gaining weight and building muscles. I slowly wanted to get back to playing basketball again. Of course, a big part of basketball is being able to jump higher. So I started doing plyometrics exercises. These types of exercises are a really good way of making your muscles more elastic and thereby be able to perform many activities more explosively and efficiently. I started off with different types of plyometrics and at one point incorporated a sideways plyometrics exercise, where you have one of your legs on a chair and the other on the floor. You then jump, pushing off the foot on the chair, you fly above the chair and land on the other side of the chair, with the foot that was on the ground now being on the chair, and the foot that was on the chair, now being on the floor. You then repeat this from the other side of the chair, jump over the chair and land on the other side again. So you repeat this sequence for maybe 10 jumps. I was doing this and at one point kind of stopped concentrating on the exercise. I landed, my knee buckled, I heard a pop and in a surreal moment collapsed on the floor. After that, I managed to get up, but my knee was busted. I rested the knee a bit and actually got up to go on the in place skiing type machine where you kind of slide your legs up and down as if you were doing cross-country skiing. I was hoping that nothing serious happened. I got home rested the knee a bit and was reading my symptoms on the internet and fearing the worst (all the symptoms were pointing to an ACL rupture). I went to sleep and got up the next day to go to work, however my knee had swollen up and was hurting. I had trouble walking. I went to work and was sitting there for a while, but the pain was not going away. So I decided to go to the hospital to get it checked out. The doctor checked it out, sent me to another room, they checked it out there. Then I went back to the original doctor and in came the verdict. Supposedly just a big sprain with a lot of liquid in the knee, but that it should subside and I should just rest the knee. So I was happy! That was sometime at the end of April. However the months were passing by and I still had problems with the knee. I couldn’t do any sports or anything involving the knee and it wasn’t getting better. Always be ready to get a second opinion, because according to the statistics the vast majority of ruptured ACLs are not diagnosed properly the first time and people don’t even know about the fact that they have a ruptured ACL. Once an ACL is ruptured you cannot repair it and instead need to get a graft from somewhere else to be put in place of the ACL. Basically there are three choices of where the graft can come from: from a tendon in the patella, a tendon in your hamstring, or a cadaver (meaning a dead person’s ACL). If you are an athlete, then the logical choice is to get the transplant from your patella, as that is the one that will limit your future movement the least (but there is the risk of prolonged pain when kneeling). I had the surgery at the beginning of September. I went in, they put me to sleep and that was that. The next thing I remember was the nurses trying to wake me up. It was extremely cold and my knee was hurting and I was feeling dizzy and disoriented. After a while of lying there, I managed to get up, take the crutches that were provided to me and start moving, hopping on one leg. However I was feeling extremely dizzy and almost managed to pass out. I was completely out of air as well and thirsty. I had apparently also had some sort of an allergic reaction to the antibiotics given to me during surgery. I managed to get to the car, was driven home and lay in my bed. I had a huge cast over the knee and was experiencing severe pain. For the next 3 days, the pain was so intense, that I was wishing that I had never done the surgery at all, but luckily the pain was getting better, especially with the help of pain killers. After the surgery, be prepared to experience some of the worst pain that you have ever felt. After that you are supposed to slowly start trying to get the knee and muscles around it to start waking up again. You have to start off slowly however. The first thing that I did was just moving the foot around and trying to clench the quadriceps muscle. After the surgery, the quadriceps completely goes away and you cannot even activate it. It feels just like liquid blubber. You have to rest your knee, but slowly try to start strengthening it. Your knee is still in that huge cast and you are using crutches to move around. Don’t try to do too much, as the graft is still in the process of setting itself in place. After the end of week 3, you can get rid of the crutches and start walking normally. It’s still going to be hard to walk though. You also need to start with a rehab program in order to strengthen the muscles around the knee and also in order to activate the quadriceps muscle. At this phase you should continue with your rehab routine and add more things, such as cycling on a stationary bike, swimming and other things. The exercises are straight-line work. Slow progression into more sports related workouts. At one point, you can start practicing pivoting again. During rehab, you also need to remember that you should focus not just on strengthening the knee (and the quads), but also other muscles, since these are all parts of a large muscle chain. You need to get all the muscles in the chains strengthened, otherwise they will be weak, and your entire muscle chain will be out of whack, leading to a higher probability of injury. The different muscles that you should also strengthen are for example the hamstrings, calves, foot muscles, glutes, back muscles and your core. 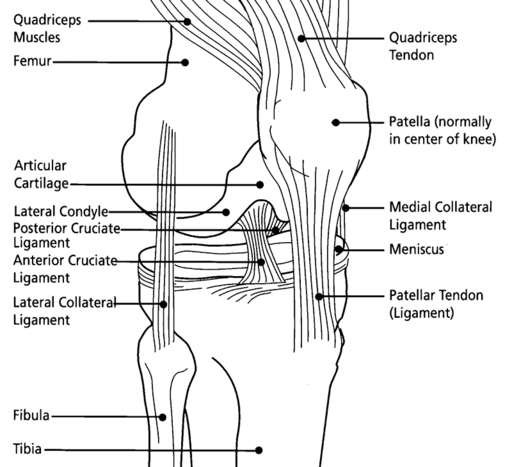 The ACL tear is a common sports injury which can take an athlete out for the entire season. WTF Is Hypertrophy And Should You Care?